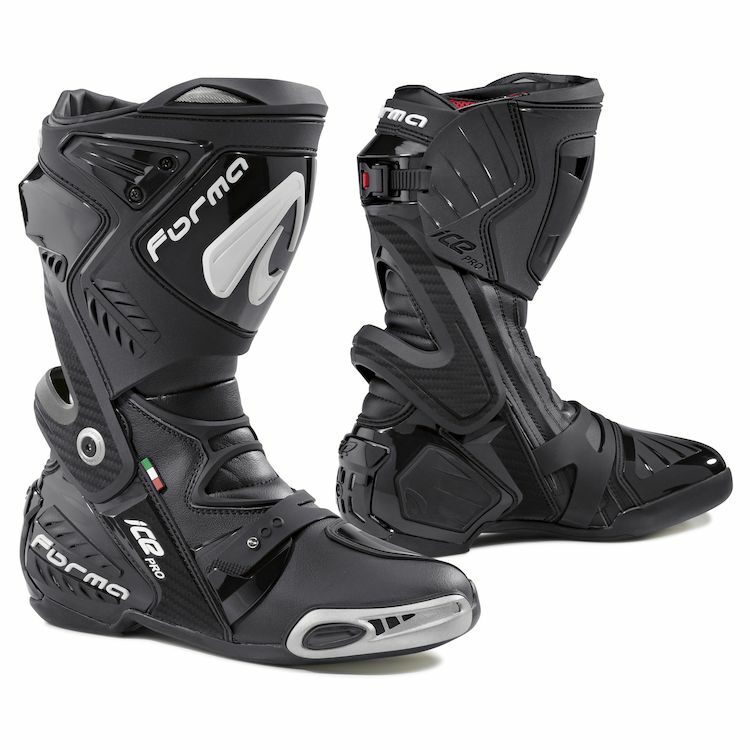 The Forma Ice Pro Boots offer riders MotoGP level performance and protection without having to crack the piggy bank. If you are looking for the latest in technology, comfort and performance, the Forma Ice Pro Boots feature Forma's anti-torsion F.C.S. frame, injection molded plastic protectors, reinforced nylon and plastic heel cups, as well as, vented stainless steel toe sliders. The Forma Ice Pro Boots are ready to compete at the highest levels, both on the track and in the marketplace. I was a 46 in my Dianeses and these fit a little better (also 46). My true foot size is 12 4E. I have wide feet but pushing the toe box down, it is completely comfortable, so they should break in like a glove. Feels great walking around and the lower heel height is great when rotating my heel onto my swingarm. Great features and quality for the money. Plus, I have large calves and these will fit over my pants. These boots are the only ones that I could find to semi match my suit, a older Dainese Silverstone.And I hope they preform as awesome as they look. can you guys do a video review on these? Are the toe sliders removable? What is the level of tactile feedback for the left toe? Hi do you have 7 USA available?